If you're a glass half full kind of person, you'll note that the Eagles' defense was outstanding last night. Most are not that kind of person. Are power rankings completely dumb and meaningless? Yes. Yes, they are. However, personally speaking, whenever I see them, I click. And now that I've promised many power rankings, you'll read it and like it. Here's where people around the country have the Birds ranked after their win over the Oakland Raiders. It took Philadelphia 10 games to pass its preseason projection. But now without Carson Wentz, who knows what will happen, but Philly is 2-0 since Nick Foles has taken over. Even accounting for Foles at quarterback, FPI rates Philadelphia as a top-three team. #JimmySays: The Eagles have home field advantage throughout, and will be sitting at home the first week of the playoffs. I get that other teams may look better at the moment, but I just can't see how you can have anyone ahead of the Eagles that has to beat a playoff team in the wildcard round just to get to where the Eagles have already earned a spot. The odds of the Eagles making it to the NFC Championship Game are better than any of the teams that have to play in the first round of the playoffs. Does earning a 13-2 record count for nothing? Home-field secure, worry for sure. The Eagles won Monday night on the strength of an opportunistic defense. Jake Elliott's clutch quadricep helped, too. Not sure anyone -- and especially fans in Philadelphia -- knows what to think of Nick Foles at this stage. How much of his abysmal play was due to the conditions? How much was due to his receivers' inability to get open? A week after the Eagles procured four scores through the air, they couldn't muster 40 passing yards in the second half against the Raiders. Foles' errant toss to Zach Ertz that fluttered into Reggie Nelson's mitts darn near lost the game. Soo, ??? #JimmySays: My apologies in advance for again pointing out the fact that every team in the NFC other than the Vikings is going to have a win a very difficult game just to be where the Eagles are. I'm going to sound like a broken record. Here, the Eagles are fourth in the NFC. Has there even been a weaker No. 1 seed? #JimmySays: Yes? I mean, we can probably start with the 2016 Dallas Cowboys. They beat the Raiders Monday night, but they just don't look like a Super team anymore. They aren't winning a title with Nick Foles. #JimmySays: Oh, so it's settled then. Alright, it's been nice writing for you all this season. I'm going on vacation. They may have (barely) locked up NFC’s home field Monday night, but Philly hardly looked like a team ready to thrive in January’s elements. #JimmySays: The Eagles are fifth in the NFC, despite being assured of being in the final four of the NFC playoffs, which makes no logical sense at all. 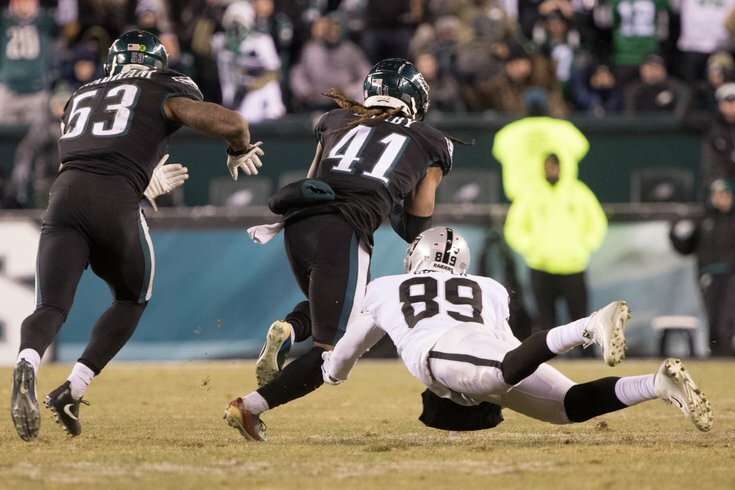 It wasn't pretty, but the Eagles got by the Raiders on Monday to secure homefield advantage throughout the NFC playoffs. #JimmySays: That's more like it.